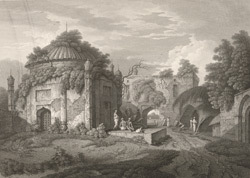 This etching is derived from plate 9 of Charles D'Oyly's 'Antiquities of Dacca'. A quarter of a mile to the east of the Bara Katra in Dhaka is the Chota Katra: essentiallty a smaller version, similar in layout, which was built in 1663 by the Mughal governor of Bengal and uncle of Aurangzeb, Shaista Khan. Historian James Atkinson wrote that D'Oyly's view of the caravanserai "is taken from within the area of the square which its walls enclose ... a small Mosque ... on the left ... Its minarets rise somewhat like the shafts of elegant octangular columns, and are terminated by capitals of oriental foliage and fruit ... and while the dome of this mosque is beautifully fluted, its uniformities of colour and form are varigated in a picturesque manner by the blue and orange mosses, and other luxurious vegetation of this part of Asia".